CANTON, Mass. 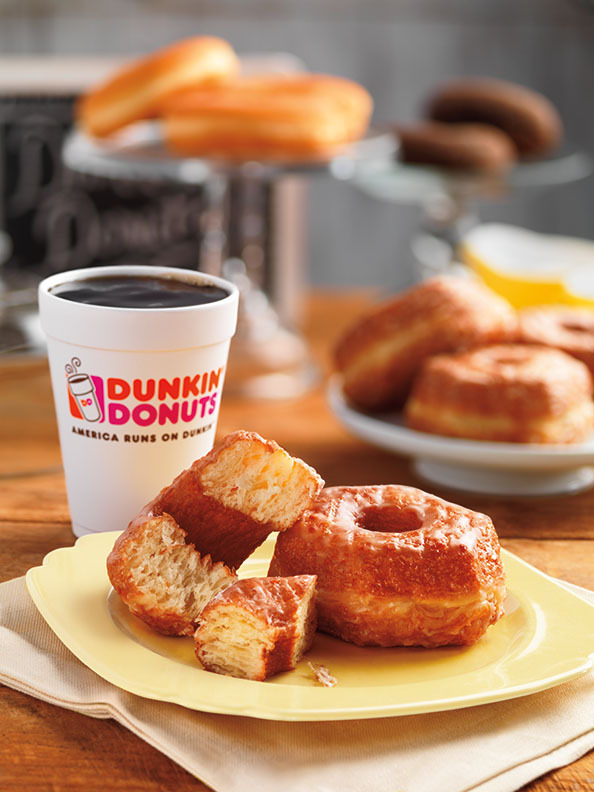 (February 11, 2015) – Dunkin’ Donuts, America’s all-day, everyday stop for coffee and baked goods, announced today that the Croissant Donut has been added as a permanent addition to the brand’s bakery lineup. The Croissant Donut, a delicate and flaky croissant ring glazed like a donut, was introduced in November as a limited-time only menu item, and became one of the most popular limited-time bakery items in recent brand history. Dunkin’ Donuts recently extended the availability of the Croissant Donut into 2015 and, due to popular demand, has now decided to make the Croissant Donut a permanent menu item at participating Dunkin’ Donuts restaurants nationwide. Dunkin’ Donuts has sold 8.5 million Croissant Donuts since its introduction as a limited-time offer in November. Dunkin’ Donuts plans to expand the Croissant Donut platform throughout 2015, offering guests new and unique flavor options. Beginning this March, a Boston Kreme Croissant Donut, a Croissant Donut filled with Bavarian Kreme and drizzled with chocolate icing, will be available at participating Dunkin’ Donuts restaurants throughout Monmouth and Ocean County, New Jersey. Additionally, Dunkin’ Donuts has brought back a heartfelt Twitter sweepstakes in honor of the return of its heart-shaped donuts (Brownie Batter and Cookie Dough donut flavors). Beginning today, February 11, through February 13, fans are invited to tweet a message to their loved one, using the hashtag #DDHearts & #Sweeps. On February 13, up to 10 participants will receive a $100 mGift and have their tweet turned into a special donut dedication video they can send to their Valentine. Each video will feature their message and a heart-shaped donut personalized with the name of their sweetheart. The donut will be personally created and decorated by Rick Golden, Dunkin’ Donuts’ Manager of Donut Excellence. One grand prize winner will also receive two JetBlue travel certificates. No purchase necessary, must be 18+ to enter. Void where prohibited. For additional terms and conditions related to Dunkin’ Donuts’ “Heartfelt” Twitter Sweepstakes, please visit: http://dun.kn/1EGWv7D. Dunkin' Donuts has been a leader in the donut category for 65 years, selling 2.5 billion donuts and MUNCHKINS® donut hole treats annually worldwide. Within the United States, Dunkin’ Donuts offers more than 70 varieties of donuts, including beloved flavors such as Boston Kreme, Glazed, Chocolate Glazed Cake and Chocolate Frosted.